Brian Koss has received a fellowship from the National Cancer Institute to support his melanoma research. 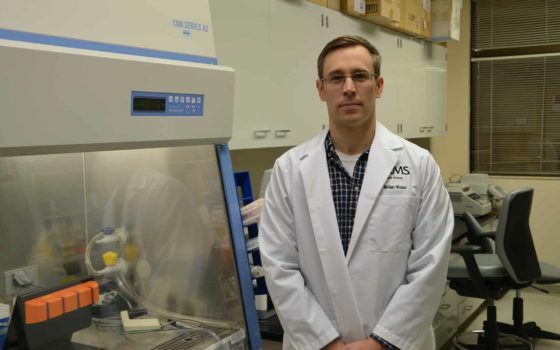 March 6, 2019 | A prestigious fellowship from the National Cancer Institute (NCI) will allow UAMS Graduate School student Brian Koss to advance his melanoma research. The Ruth L. Kirschstein National Research Service Award for Individual Predoctoral Fellows (F31) will provide Koss with a three-year award of $124,851 to fund his research focusing on the protection of tumor-infiltrating immune cells in melanoma patients. Koss, a third-year student in the UAMS Graduate Program in Interdisciplinary Biomedical Sciences, is now one of a select few scientists at UAMS ever to receive an F31 fellowship from the NCI. “Becoming a National Cancer Institute-funded fellow has positioned Mr. Koss for immediate success during his graduate training, and also has primed him to become a nationally competitive cancer researcher in the future. These awards are highly competitive, so receiving this fellowship is a testament of Mr. Koss’s hard work, innovation and desire to help cancer patients in Arkansas and across our nation,” said Alan Tackett, Ph.D., associate director for basic research in the UAMS Winthrop P. Rockefeller Cancer Institute. Koss is in his third year as a member of Tackett’s lab team at the UAMS Cancer Institute. “Melanoma tumors apply many repressive factors on immune cells, which can prevent the success of standard immunotherapies,” Koss said. Immunotherapy is a type of treatment that stimulates a person’s own immune system to recognize and destroy cancer cells. It has been found to be a very successful method of treatment for many, but not all, patients with melanoma, the deadliest form of skin cancer, and is now considered standard of care for the disease. Koss’ research has revealed a method to protect immune cells in the harsh melanoma microenvironment which is known to prevent successful outcomes for some patients. His fellowship award will allow him to further define his findings and apply them to preclinical models of melanoma. “This fellowship is impactful not only for Mr. Koss, but also for UAMS, as it highlights the innovative cancer research at the Winthrop P. Rockefeller Cancer Institute and supports our ongoing mission to become a National Cancer Institute-Designated Cancer Center,” Tackett said.